The Offering sent me a rather nondescript email a little over a month ago that almost failed to catch my attention, but I happened to see Godflesh mentioned (as were Tool and Ministry) and had to give 'em a try. I would actually not compare them to any of those three bands, but was immediately intrigued nonetheless: newly-released four-year-old recordings from a defunct Scottish trio experimenting with a diverse and affective form of lightly industrialized metal loaded with doom, dissonance, melody, and closing with a Pink Floyd cover!? Yep, this is something worth sharing. The Offering existed as sort of a side project from around 2010 - 2014, but the Bandcamp page is slim on information, so… who did what in The Offering, and what were your primary bands during the time that The Offering was active? The Offering (at this time) was Jason, Aaron, and I (Mitch)—three friends from the east coast of Scotland. A previous incarnation existed, which I was not involved in and know little about. I did some shouting; Aaron played the guitars and sang/shouted; and Jason played drums and synth, sang, and put the pieces together. Jason's friend, Sean, played bass on the recordings and sang on "Breathe," though was not an active member. The other bands we played in at the time were of a heavy/underground manner. I've no wish to link them with The Offering, as I've found the project to be a very different beast, and feel its recordings are strong enough to stand alone without their association. The material works a really diverse amalgamation of influences into a form of surging, industrial-tinged metal that touches upon a number of genre delineations without being able to be pigeonholed into any of them. Did you set out with that approach in mind, or did you just naturally evolve into it? The development of this sound can be considered a sum of parts rather than an intention, perhaps due to the way we went about the writing and recording process. Aaron would write guitar riffs alone, he and I would then visit Jason's apartment in a different city to make recordings of these against improvised drum tracks. Lyrics were often written and recorded in the moment, with the end product being later crafted by Jason and sent to Aaron and I for feedback/approval. Between the three of us, our musical tastes may be considered diverse. We're old enough to wear a fair share of influences on our sleeves, though followed no direct cues or formula—we made this music for us. They relate to humanity and life's journey/struggle, largely from a personal perspective—actions, feelings, hopes, doubts, questions, and reflections. These lyrics differ from other works I've written, which often had an edge—a direct point to be made. In comparison, they're abstract and vague. I'm okay with that. The cover, "Breathe," was picked because we all like Pink Floyd—particularly that song—though lyrically it also fits within this spectrum. These recordings sat around for three or four years before being digitally released on Bandcamp. Were you half-working toward this all along, or did something finally light a fire to get this stuff out there? Why now, finally? For the last four years I've lived overseas (currently at the top end of Australia). I left Scotland soon after the recordings were finished (2014). This explains some of the delay in their publication. Every so often we'd chat online and make progress regarding mixes, artwork, etc. ; then fall into silence for months, rinse and repeat until we got to where we are now. Since we did not function as a live band or public entity, there was no pressure to get things done—we took our time with it because we could, achieving results that met our expectations. The artwork kind of threw me for a loop. Not so much the subject matter, but—to me—the color scheme and tone create a different aesthetic than the music, so I was quite surprised by what I heard, and sort of forced to take note. It seems possible that this may have been an intentional decision? This was created by Anni Buchner, an artist from South Africa whose portfolio I found online. Attracted by her style and use of color, I made contact. After receiving the lyrics and music, Anni came up with three potential designs. We each scored these on a scale of 1 to 10, the piece with the highest total being the one we used. It was an easy and straightforward process which yielded great results—in fact, picking a font to match was more collectively taxing. Regarding aesthetics, whilst pleased to hear that their contrast provoked a reaction in you, I can't say this was a conscious or intended direction. The Offering never played live and is currently inactive, but you mentioned to me that there is some possibility of future activity. What are the odds, realistically? It's possible. I'd like to return to Scotland one day and live there again, I consider it home. Should that occur, perhaps we'll continue on from where we left off—if it works for us, I hope so. When you first emailed me, The Offering was touted for fans of Tool, Ministry, and Godflesh, but I suspect that you may have some interesting influences of a more obscure nature, too. Thinking in terms of those lesser-known gems, what would you cite as three to five albums recommended for fans of what you've created with The Offering? I don't necessarily consider these records obscure. Though obscurity is subjective, they are good. Thanks for the interview! 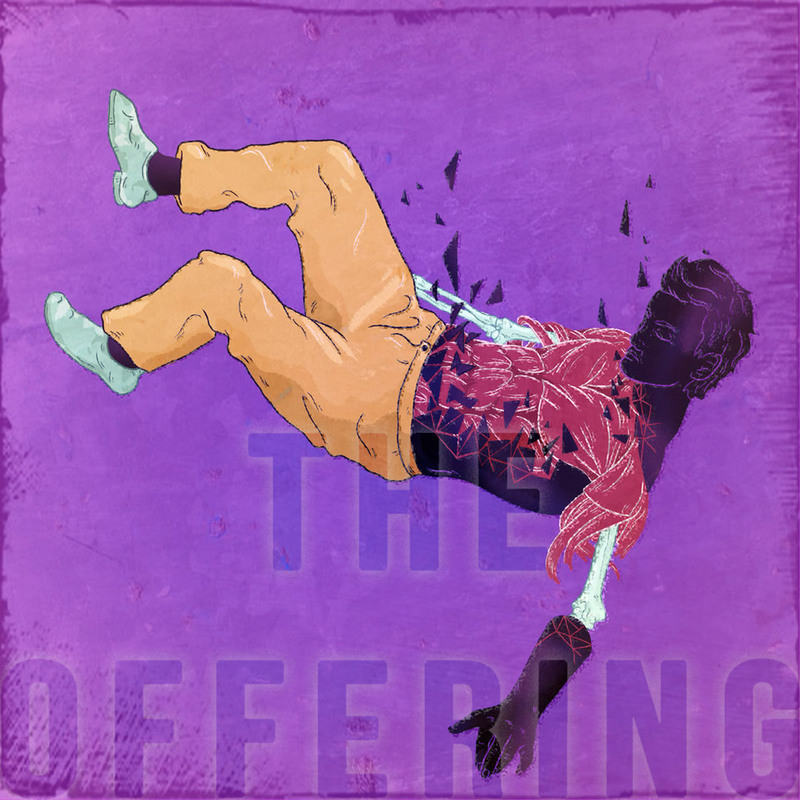 Download The Offering for free over at Bandcamp.